Everyone has the standard family photo where all the subjects are donning their best attire and smiling politely to the camera. While these types of photos certainly do have their place on the family mantle, some folks like to spice up their photo albums with something unique and a little more humorous. 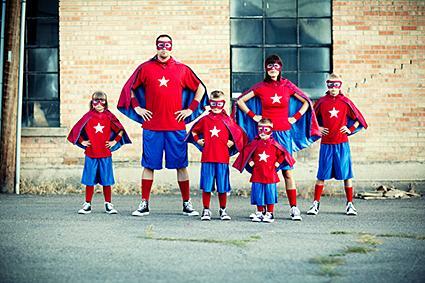 Try some funny family picture ideas to get a laugh out of viewers and preserve some good old-fashioned family fun. Take a photo that mirrors the hectic life often lived in these modern times. Pose dad with a cell phone in one hand and a handful of paperwork in the other. 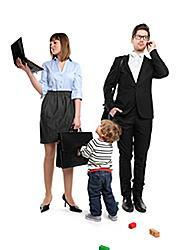 Mom might be juggling a briefcase and a baby or a soccer ball and might look a bit frazzled with uncombed hair. The children in the picture could be fighting with each other by having one sibling pretending to pull hair while the victim is crying. Older children, such as teens, might be playing a hand-held video game or texting. Every family member should be concentrating on what they are doing and not paying any particular attention to each other or the camera. Many people will find this funny, as most can relate to this type of disjointed scene. Wintertime is typically a popular time for families to take pictures to send out as their Christmas or holiday card. Consider ditching the traditional red sweater and winter gear for the ugliest holiday sweaters imaginable. This type of photo lends itself to some cheesy smiles and maybe a few props like some mistletoe for mom and dad to kiss under or a gaudy Christmas tree in the background. Also consider posing the family with song books or sheets so they appear as if they are singing carols. Don't forget to include the family pet with a matching sweater. Another way to have fun with holiday photos is make all the subjects look like beautifully wrapped gifts. Wrap a large cardboard box with wrapping paper and remove the bottom and cut out holes for the head and arms. Make one of these for each member of the family. 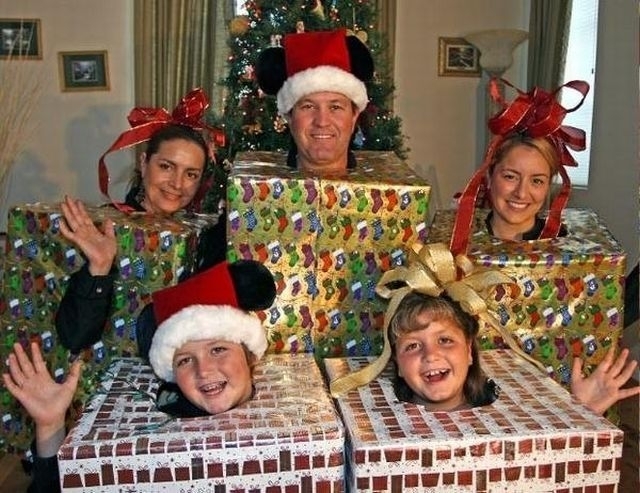 Put a large bow on each person's head to complete the look and stand in front of the family Christmas tree for a fun family photo. Another funny holiday picture is to have the parents sit back to back and then wrap a string of lights, garland or ribbon around them. They should have a frightened look on their faces and the kids can be standing around them with smirks on their faces as if they had just tied them up. Have one of the parents hold a note that says, "Being held hostage for gifts," or "Please send help." Choose a favorite group of related characters to dress as for a funny family picture. Consider a favorite book, television show or movie to mimic in the photo and dress-up each member of the family to resemble one of the characters. For instance, a family who is a fan of the Star Wars series might choose to dress in costumes resembling their favorite characters. Add a few appropriate props such as light sabers that can be used for a battle between members of the family. Photos like these can be especially humorous when sent to family and friends who are used to receiving a traditional family picture. A family can choose a literary classic such as the Wizard of Oz and have each member of the family dress-up as one of the characters including the family dog who can pose as Toto. Consider a role reversal such as having the dad dress like Dorothy or the witch and have the mom dress like the Scarecrow or Wizard. 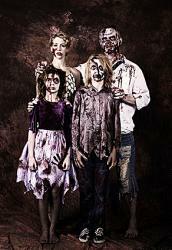 A family of monsters or zombies might also create a funny photo. Have everyone dress-up and then stare at the camera with no expression or show the characters going about their daily activities such as cooking or doing homework in their costumes. Also consider having having just the parents dress-up in scary costumes and have them standing behind their children, scaring them. Mix it up a bit by having family members doing unexpected things in the photo. If a dad is known for his masculinity, have him dress in a ballet tutu or wear a princess crown. A little girl who lives in pink might want to don a black leather motorcycle jacket and a mom who is typically wearing casual clothes, may want to dress like a Hollywood vixen for her photo shoot. Family members might want to use props they can interact with in order to better represent what they are doing and to help avoid giving the camera the familiar stare and smile that is present in most portraits. 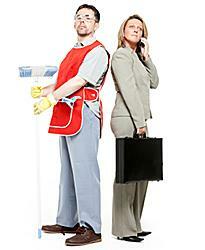 Consider having dad pose with a feather duster or vacuum cleaner. Mom might hold a briefcase and cell phone and be posed back to back with dad. The kids may also mix-up their roles with the sister posed with a basketball, while the brother is playing with dolls or baking something. Create a photo booth type atmosphere by setting up a solid colored backdrop. Have subjects hold an empty picture frame or hang the empty picture frame from the ceiling at a level where the subjects can look through. Provide a box full of fun and interesting props and costume pieces and allow each family member to dress-up in what they want to. Provide cowboy hats, fake mustaches, silly oversized glasses and a variety of wigs. 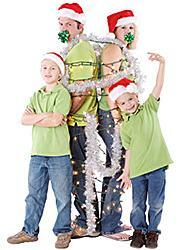 Parents and children can dress up and pose in fun and spontaneous poses while someone else takes the photographs. Subjects should make faces and interact with each other. There is a fine line between humorous and vulgar or offensive. Try to be mindful when planning photos that these pictures will be around for many generations to come. Additionally, with the modern age of shared information via the Internet, keep in mind that a photo that is shared with friends could potentially be forwarded to others or even posted online without your knowledge, so be careful not to share photos that are embarrassing to any member of the family.